VENTURA, Calif. —The swell lifted Jason Morton's sea kayak like a cork. Then the waves smashed over the breakwater at Ventura Harbor. Morton lowered a baited hoop net into the heaving ocean. He was after the lobsters that come out at night to feed. Hoop netting for lobsters and crabs is legal in California and is growing in popularity, especially among kayakers who use their craft to set nets in shallow water. "It can be mystical and it can be exciting," said Morton. "People talk about hearing a splash in the distance. Some find it spooky." Hooping netting for lobsters at night is also a way of expanding fishing opportunities for those with day jobs. Jason Morton gets his kayak ready, with the rear deck hauling hoop nets for lobsters. 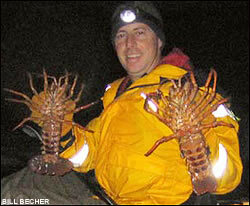 Lobstering from a kayak can be very thrilling on nights with big winter swells. Stars wheel overhead and sounds and smells seem more intense in the dark. Most nights are calmer. Early in the season the water can be glassy flat and shimmering with bioluminescence. Jim Cook was also setting nets from a kayak. "You can get in and out of tighter places than you can with a power boat," said Cook. "You don't have a motor sound in your ear — it's very peaceful." Morton placed chemical light sticks in empty plastic pop bottles and tied them to the 60-foot line attached to the nets. That way he can find the five nets that each California hoop net angler is allowed. The nets are made of nylon mesh with a 32-inch metal outer ring and 12-inch inner bottom ring. They sit flat on the ocean floor until retrieved — then the rings form an open topped enclosure. The Promar nets Morton uses have a pouch for bait that's designed to keep lobsters pecking at it and the bait away from fish and other predators. Morton generally uses scored or butterflied mackerel for bait as the oily fish make a scent trail that attracts lobsters and crabs. Sometimes the scent attracts other fish too. Anglers have found rockfish, bass, rays and sculpin in their hoop nets. One found a moray eel in his net when he pulled it in. 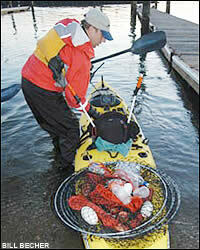 Jim Cook displays two lobsters he caught hoop netting from his kayak. Hoop nets are not a legal method of take for most fin fish and with a few exceptions they must be released back into the water according to Carrie Wilson of the Department of Fish and Game. Ben Hong, product development manager for Promar Nets, said that until recently hoop nets were used mostly by Northern Californians after Dungeness crabs. He credits rock fish closures as motivating Southern California anglers to try hoop netting for lobsters and crabs in the fall and winter. "More people are going after crabs this year," said Hong. Commercial fishermen market spider crabs as California king crab he said. "They look kind of disgusting at first but there is a lot of nice meat there," said Hong. "And rock crabs have a lot meat in their claws." Hong suggests using sonar to meter for rock piles and artificial reefs and setting nets close by if jetties and break walls aren't producing. As the water gets colder lobsters tend to move into deeper water. Hong recommends a steady haul when lifting the nets. "When you make a constant pull water pressure keeps the lobsters in the bottom of net," said Hong. "If you stop they can jump out." Baited hoop nets may be used to take spiny lobsters and all species of crabs. California sport fishing license with ocean enhancement required if 16 years old or over unless fishing from a pier. Not more than five baited hoop nets may be fished by a person to take spiny lobster and crab, not to exceed a total of 10-baited hoop nets from any vessel. Limit on piers is two nets per angler. Open season for spiny lobsters is from the Saturday preceding the first Wednesday in October through the first Wednesday after the 15th of March. Carry a lobster gauge (available at dive shops) to check length. Minimum size is three and one-fourth inches measured in a straight line on the mid-line of the back from the rear edge of the eye socket to the rear edge of the body shell. All lobsters must be measured and any undersize lobster released into the water immediately after they are brought to the surface. All fin fish by catch except herring, Pacific staghorn sculpin, shiner surfperch, surf smelt, topsmelt and anchovies must be released. You can also keep shrimp and squid in addition to crabs and lobsters. Check DFG regulations at www.dfg.ca.gov/mrd/index_regs.html for details and changes. Morton gets most of his lobsters in shallow water — from 10 to 30 feet deep. He uses a powerful Hummingbird 405SX fish finder mounted to his kayak to chart the bottom structure. Morton looks for patches of eelgrass near rocks where lobsters can hide during daylight hours. He sets five nets, leaves them for about 20 minutes, then hauls them up to check for lobster. This takes some effort, and by the end of the night he's had a good workout — and often several legal lobsters from 1.25 to two pounds. His biggest of the season was a five-pound bug. Morton carries a metal gauge to check the lobsters for the minimum 3.25-inch carapace length. Morton wears gloves like those used when cleaning fish to help protect his hands. Spiny lobsters are just that — they have two sharp spines above the eyes and a series of spines on a ridge below the tail. He suggests grabbing lobsters from the tail going forward to avoid these spines that point toward the head. Wearing gloves also helps avoid rope burns when pulling in nets. Timing the "crawl" when lobsters start moving is key to success according to Morton. He likes to set his nets just before dusk. "Like a fish bite, all of a sudden it's active." This night Cook scored four legal lobsters. He likes to barbeque the tails. Don't forget the melted butter. Spiny lobsters inhabit coastal waters off Ventura, Los Angeles and San Diego counties. The season is open until March 16, 2005. Information about kayak fishing is at www.kayaksportfishing.com. For hoop nets and tips on using them check www.promarnets.com. The Promar nets come with line, floats and 100 feet of line and cost about $25 to $30 depending on size. They are available at many tackle shops including Malibu Fish N' Tackle in Thousand Oaks, Taylor Tackle in Canoga Park and Bob Sands Fishing Tackle in Van Nuys. You will want to bring a lobster gauge, waterproof floodlight, headlamp and gloves. For safety wear a PFD, carry a marine band VHF transceiver, display navigation lights and tell someone where you are going and when you will be back. Bill Becher can be reached at billbecher@yahoo.com.